Fall off the bone tender Short Ribs of Beef that have been slowly braised then piled on top of truffle mashed potatoes and drizzled with a red wine sauce is one of the most comforting meals you can imagine. Go into a nice restaurant this time of the year and you will usually see a dish like this on the menu. Thankfully the short ribs are so easy to prepare that you can make them in your own kitchen. Serve this meal for a Sunday supper or at a dinner party and make everyone at your table happy. Serves 2, adjust the recipe accordingly. 2 Tbsp. olive oil plus an additional 1 Tbsp. *Note: You will be reducing the stock, so be careful with how much salt you use in this recipe, particularly if you’re using beef stock with sodium in it. Salt the short ribs lightly* and season with pepper on both sides. Heat oil in a ovenproof pot and when hot add the meat fat side down. Working in batches, if necessary, brown the meat on all sides then remove to a plate and drain rendered fat from the pot. Add the remaining tablespoon of oil to the pot. When hot add the onions, celery and carrot and sauté until soft and just beginning to brown. Add the garlic and cook 1 minute. Add 1 Tbsp. flour, stir well, then add the tomato paste and cook, stirring until tomato paste darkens. Add the red wine, scraping up all the brown bits and cook until reduced by half. Add thyme, bay leaves, beef stock and mushroom broth or water and stir well. Return the short ribs to the pot, bone side up, with any juices. The liquid should almost cover the meat. Bring to a simmer, cover with a tight fitting lid and place in the oven. Braise for approximately 2 1/2 to 3 hours or until very tender. Check once or twice while cooking and if the liquid has cooked down too much, add additional water or broth. Remove from the oven, set the short ribs aside and cover to keep warm. Strain the broth in a gravy separator. Discard the vegetables and herbs. Make a roux by melting the butter in the same pot over medium heat, add the remaining 2 Tbsp. of flour, whisk until a paste forms. Gradually whisk in the reserved broth, eliminating any accumulated fat in the gravy separator then simmer until it becomes a sauce consistently. Taste and adjust seasoning if necessary. If not serving the short ribs immediately, you can cover and keep them in a low oven for about 30-45 minutes. Serve the short ribs on a bed of mashed potatoes, polenta or noodles and top with some of the reduced red wine sauce. Cook the potatoes and garlic cloves in a large pot of boiling salted water until very tender, about 20 minutes. Drain and return to the pot. Stir in the half and half, and the butter then mash until smooth. Season to taste with salt and pepper then drizzle with a little white truffle oil. The tender short ribs that are braised in a red wine sauce are a comforting meal, especially during the cold weather season. Served on a bed of truffle mashed potatoes, you will think you are in heaven after the first bite. While I served the short ribs with truffle mashed potatoes, they are also excellent with creamy polenta or noodles. Thankfully the short ribs are easy to prepare and can even be done the day before. Actually, if you have the time to wait, the flavor improves after a day in the sauce. This makes a meal which is perfect for entertaining your friends. Easy and delicious…it doesn’t get much better than that. Enjoy! 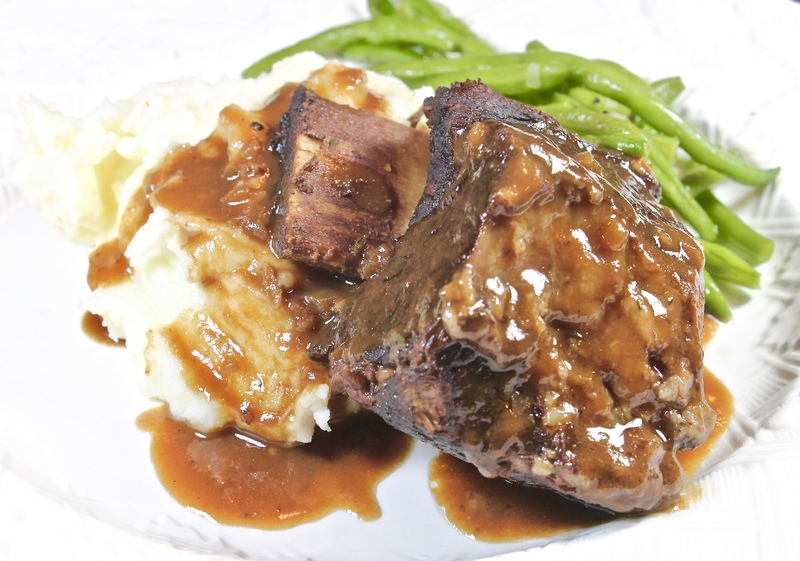 This entry was posted in food, Home, photography, recipes and tagged beef short ribs, braised short ribs, comfort food, Dinner, red wine braised short ribs, red wine sauce, truffle mashed potatoes, wine braised beef. Bookmark the permalink. What a gorgeous recipe, Karen, and I love the idea of the truffle mash with it. Thank you Kay for your nice. compliment. We thought the truffle mash really went well with the short ribs. I love short ribs. I am pinning. Have you tried truffle butter from Trader Joes? It sells in 3 ounce package for a couple dollars. I would love your input. I made Ina’s truffled pasta with it. I am not sure how I feel about it since I don’t really know what truffles taste like. Hi Madonna, Thank you for the compliment and pin. I’ve not had the truffle butter from Traders Joes. We don’t have one in our part of Florida but the next time I’m in south Florida I’ll be on a look out for it. We always take a cooler when we go down to visit our children and stop at Trader Joes and Costco before we head back to Vero Beach. We love truffles…they have a very earthy aroma and taste. Oh goodness, truffle mashed potatoes! Sounds so good!! Hi Jenna, truffle mashed potatoes are as good as they sound, thank you. Karen, I love short ribs, the ultimate comfort food! With the addition of truffle mashed potatoes, it is perfect! Hi Pam, This was definitely a comfort meal and oh so delicious…thank you. I love short ribs and I’d be in heaven with garlic and truffle mash. Comfort indeed! Hi Mad Dog, Yes, I do believe this is a dish you would enjoy and the truffle mash went perfect with the beef short ribs. Thank you. Slow braised short ribs are the most delicious winter comfort food! Combined with truffled mashed potatoes, oh my. This sounds so delicious, Karen. Thank you for your compliment Susan. The short ribs and truffle mash potatoes truly are comfort food. Karen, this looks incredible. I swear you’ve described the perfect meal in that first sentence. Pinning. Thank you for your kind words Lea Ann and the pin, they are most appreciated. I’m glad you like the short rib recipe. You are right, this is the ultimate comfort meal and it’s wonderful that you can prepare the ribs the day before. It’s makes it an easy meal to entertain. Hi Gerlinde, When entertaining, I love to have recipes that can be prepared ahead of time. The nice thing about the short ribs are that the flavor also improves. What a perfect meal Karen. Love the truffle oil in the mashed potatoes. Thank you for your nice compliment Penny, I’m happy to know you like the sound of this meal. Yes, I do love the addition of truffle oil in mashed potatoes and they went great with the short ribs. Great recipe. I am also a fan of Wondra. What a fabulous dinner this makes. Thank you Jovina, for your nice compliment. I’m glad that you like Wonder too…it is a great ingredient for no fail sauces among other things. Thank you Diane for your nice compliment. All is well here…I’m sorry that for some reason I’m not able to comment on your blog posts any more. Hope the two of you are good as well. Thank you Angie. If you get a chance to make the short ribs, I hope that you will enjoy them as much as we did. I love short ribs. I make a very similar recipe, but without the mushroom broth. I love that twist! Tonight I am making wine braise pot roast. Hi Penny, I’m glad you like the idea of the mushroom broth. I make and use it often as it adds a depth of flavor to braised meat dishes. LOVE short ribs, and really like them braised in red wine — one of our favorite dishes. Your version looks great — super recipe. Thanks! Thank you John, I’m glad that you like my version of short ribs. Hi Ronit, Although winter in Florida is a piece of cake since we don’t get snow, we do get some cold weather and the short ribs were enjoyable comfort food. Thank you for your nice compliment. Thank you Sylvia for your compliment. I do hope you will enjoy the short rib recipe. I don’t know about you in Florida, but here in Arizona it never gets cold enough for comfort food like this. So we have been known to turn the air conditioning even colder, just so that we can have something like this! Can’t wait to try it, Karen! Such a fabulous recipe for short ribs, ultimate winter comfort food. This is a great idea for Super Bowl Sunday! Thank you for your kind words Deb, I’m so happy that you like my recipe for the short ribs. I don’t think I’ve ever bought/cooked short ribs. They look delicious. Hi Boleyn, Our market doesn’t have short ribs like these often so I had to buy some and make this dish when I found a package. When we were in New Hampshire, I would buy them often but the cut was different…they were boneless. If you find some, I think you would enjoy them. Thank you. I’ll have to keep an eye open for them. Hi Gary, You described the short ribs perfectly…they were all of that and more. Thank you! Hi Rocquie, Thank you for stopping by for a visit and your nice compliment. I do hope you get a chance to try short ribs, they are delicious. Karen, a cold January rain is falling here, I have been standing outside giving a talk on Bromeliads….if only I had the ingredients, sounds so perfect for tonight..maybe tomorrow. Hi Amelia, The weather this winter has not been the norm…we found the short ribs to be a nice meal on a cold, rainy day. I’m glad you like the recipe, thank you. The turkey chili sounds wonderful as well. I have a new Instant Pot and have been playing with chili recipes, the latest Bison Black Bean was pretty good. Karen, are you trying to kill me? Just the thought of this meal has me drooling. Golly, this sounds amazing! I too have used dried porcini mushrooms as a ‘secret’ ingredient for some gravies, just a little goes so far and adds wonderful depths. I can’t even begin to comment on the truffles, sigh. A mouth watering read! Thank you Jo for your lovely compliment. I’m glad you are a fan of using dried porcini mushrooms to add depth of flavor to a dish as well. Like the use of thyme and mushroom stock to go the ‘umami’ route. Short ribs actually not so easy to access in rural Australia but shall try . . . love truffles of which Down Under now is a major producer but rarely eat potatoes . . . we’ll find another base . . .
Hi Eha, The short ribs are not that common in our market either, so when I saw them they were a must have. This recipe would be lovely with a nice piece of lamb as well. I really love short ribs. Hi Carolyn, If you like short ribs, I believe you would enjoy this recipe. Thank you Fatima, I’m happy to know that you like the short rib recipe and yes, the truffle potatoes went great with them. I love making short ribs or beef cheeks for a dinner party for that precise reason — you can do all the cooking the day before, then just reheat it. It even tastes better having sat in all its braising liquid for that extra time. Hi Carolyn, It sounds like we both like easy entertaining and a dish like the short ribs sure does make life easier and they definitely taste better the next day. Thank you David, I do have to agree that short ribs and truffle mashed potatoes are true comfort food, perfect when the weather is cold. I would have this a few times a week if I could. Braised short ribs are such a special treat, especially in wine! And what better way to soak up the juices than mashed potatoes. YUM! Hi Pam, I think my husband would agree with you…he loves short ribs. Thank you for your nice compliment. I just finished off 3 large slices of pizza, but I’m hungry all over again reading your description of this dish!! Hi Thao, I know what you mean…looking at the photo of the short ribs makes me hungry too. Thank you for your compliment. I love the presentation – the short ribs and the truffle mashed potatoes look wonderful. Beyond comfort on a plate Karen. Beautiful meal. Thank you, thank you!! I recently bought short ribs and had no idea of what to do with them. It didn’t help that I only bought three!!! Got this Pinned. Please visit my Pin boards. Link is on my blog. This is my kind of meal during weekends! I love wine braised meat and of course mashed potatoes! Hi Katerina, I agree with you wholeheartedly. The weekends are the perfect time to prepare a meal of braised meats. Thank you for your nice compliment. Love beef cooked on the bone like this. It was easy to get in France but really difficult in the Uk. Looks delicious! Hi Amanda, Isn’t it interesting how the cuts of meat vary from country to country. Do you miss France or are you happy to be back in the UK, I know they are so different. This meal is our idea of heaven! Slow cooked and over a bed of truffled mashed potatoes. What is not to love! Delicious! Thank you Bobbi, It was indeed a “heavenly” meal. Karen, I love this recipe! The mushroom broth sounds like an amazing addition to this dish. I’m not sure I have ever seen veal stock in the store before. Is something you’ve been able to find or do you make your own? Thank you Debbie, I’m glad you like the recipe. I make a mushroom broth and add it to lots of recipes as a flavor enhancer. Yes, some markets carry frozen veal stock but beef stock works great and every market has it. I was just thinking about what to make for Kurt’s birthday dinner. This would be perfect! The short ribs and sauce look lovely. Hi Lisa, This is one of my husband’s favorite dishes, I’m pretty sure your husband would enjoy it as well. This looks so delicious, I can almost smell it. Thank you for sharing! Hi Sherryl, Thank you for stopping by for a visit and your nice compliment. I’m happy to know that you like the recipe. One of my all-time favorite meals! Whenever I’m in the mood for something comforting and a little special – this is it! Gorgeous! Hi Annie, Short ribs are a favorite of my husband as well…I’m glad you like the looks of the short rib meal. Thank you. So beautiful and mouth-watering, Karen! I love braising season! And those potatoes – just WOW! Thank you for your lovely compliment Laura. I agree with you about braising, a slow braised meal is very comforting. These sound amazing, just the thing for a cold night. Wonderful! Oh my…this is the ultimate meat and potatoes dish – great comfort food! My husband loves cooking short ribs. I’m going to have to pass this recipe on to him. Thanks Karen! Hi MJ, I hope you and your husband will enjoy the short ribs as much as we did. Thank you for your nice compliment. What a brilliantly indulgent meal, perfect for this time of year! Hi Caroline, I appreciate your nice compliment, thank you! A delicious thought Karen. Temperatures are falling here in Dublin and something along these lines will get on to the weekend menu. Hi Conor, I’m glad you like the idea of short ribs, I know you have made some delicious ones yourself. My kind of meal! I bet those potatoes would be perfect with those short ribs. Hi Pam, Truffle mashed potatoes were the perfect accompaniment to the short ribs. Thank you for your nice compliment. What a comforting winter dish! I am always a sucker for anything truffle. When a restaurant has fresh ones I can never pass them up. Thank you Laura, for your compliment. I know what you mean about truffles…love their earthy flavor. Hi Julie, Yes you have a way to go before you start thinking about comforting winter meals. Thank you for your nice compliment. Beautiful. Short ribs are one of my top 5 meats if I had to pick. Or maybe top two besides lamb. Yours are luscious looking. I was just visiting my girlfriend and she uses truffle oil on everything. Crostini, risotto, my eggs in the morning…. I have some and truffle butter as well and I need to start using it more! Thank you for your lovely compliment Mimi, I’m happy to know that you like the looks of the short rib dinner. Oh Karen, what else do I need in this cold weather? The beef short rib looks delicious and yes, paired with the truffle creamy mashed potato is just a match from heaven. Enjoy the rest of your week! Hi Juliana, I’m glad you like the idea of pairing short ribs with truffle mashed potatoes, we loved the dish. Thank you for nice compliment and wish. My mouth is literally watering thinking of these short ribs, Karen! And truffle mashed potatoes? Over the top delicious!! I appreciate your nice compliment Marissa about the short ribs and truffle mashed potatoes…thank you. To be frank, you’ve got me at truffle mashed potatoes… I love truffles so much, mashed potatoes too… I could even eat a raw carrot with these and would love the dish, but your red wine braised short ribs with the truffle potatoes sound like a dish from paradise! Thank you Sissi, for your kind words about my short ribs and truffle mashed potatoes. I’m in total agreement with you when it comes to truffles. Hi Fritzie, Thank you for stopping by for a visit and your nice compliment about the short ribs. I hope you will enjoy them if you get the opportunity to try the recipe. Mmmm…. I have just been given a fast/slow cooker and I think this may be the second dish I will make with it, the first being lamb shank massaman curry. I can’t wait to try it. Hi Kathryn, Your new fast/slow cooker will definitely come in handy for recipes like the short ribs and lamb shanks. Enjoy! A wonderful dish for a snowy evening meal. Short ribs are difficult to get here, but we do get a lovely pork short rib (called Tjock revben) that I’ll be trying your recipe with. I love the idea of serving the ribs on truffled mashed potatoes. Hi Ron, Pork short ribs…now that sounds really good. Thank you for your nice compliment. Hi Amy, I’m always happy to share my recipes…thank you. Hi Charlie, What a happy surprise to have you stop by for a visit, you certainly have been missed. Yes indeed, this truly was a comforting meal. Thank you for your nice compliment. Thank you Debra, for your nice compliment. Fall and winter is usually when I see short ribs on menus. That is unless they have been cooked and shredded and are part of a dish like ravioli, etc. This is my mother’s favorite dinner. I can see why! Hi Abbe, I have a feeling your mother would enjoy this recipe. Thank you for your compliment. My husband orders short ribs any time he spies it on a menu. Perhaps I’ll surprise him and make this beautiful recipe before we go off on holiday. Hi Eva, My husband does the same thing. When we saw short ribs in our market, I knew that they were going home with us. My oh my but these short ribs do look AMAZING Karen. So tender. Valentine’s Day is coming and we were just talking about “staying in” this year and cooking something special like this. A really spectacular meal, thanks for the recipe and beautiful photography. I actually have the white truffle oil too. Jon will love it. Hi Allie, I hope that you had a wonderful Valentine’s Day. If you got a chance to make this dish, I hope that you enjoyed it as much as we did. What a delightful combination of beef and potatoes! Pure comfort and Bill would love to come home to this!! Hi Liz, It seems that our husbands both enjoy this kind of a meal…thank you for your compliment. What an elegant way to do short ribs! Can’t beat comfort plus elegance! Thank you for your lovely compliment about the short ribs Inger, it is much appreciated. How delightful this is a class beef short rib dish and paired with truffled garlic mash it is just perfect. Thank you for stopping by for a visit Merryn and your lovely compliment. This dish sounds so comforting and delicious! Perfect for a snowy weekend. This is so beautiful, the perfect winter meal. Hearty, comforting and company worthy. Love the truffle mashed potatoes. Thank you for your nice compliment Jean, this really was a comforting winter meal. This is my idea of the perfect winter comfort food meal, Karen! Looks like a proper dinner, Karen. Delicious. Thank you Amalia, for your nice compliment…it was delicious.